Is this the Nvidia GTX 1180’s PCB laid bare? The Nvidia GeForce GTX 1180 may have just been spoiled again, as a new photo rumored to depict GPU’s printed circuit board (PCB) has just leaked. What you see below is the our second ever look at what could be the rumored Nvidia GTX 1180 courtesy of a Baidu poster. Going by the photo, we can see eight memory dies dotting around the main GPU core, which we expect to give the graphics card at least 8GB of video memory – GDDR6 type VRAM going by the last shot of the PCB we found. Some online outlets suggest the GTX 1180 might feature as much as 16GB of GDDR6 VRAM, but we find this highly unlikely. The prototype PCB also seems to include both 8- and 6-pin power connectors (top right). Comparatively, the current Nvidia GTX 1080 only needs to pull power through one 8-pin power connector, so we may have a more energy hungry GPU on our hands. There are also appears to be support for four video-out connectors (along the left side) as usual, but one of them is smaller than the rest. This could suggest we might get our first graphics card with a USB-C port. Could this be Nvidia getting in line with those recently pushed standards for simpler VR? Meanwhile, the drastically revised SLI connector (top left) suggests there will be a new platform for multi-GPU configurations. 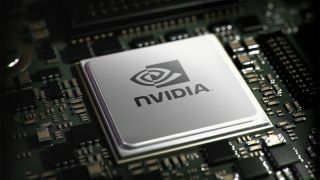 The most logical progression would be for Nvidia to introduce NVLink for gaming cards, as the technology has helped GPUs and CPUs share data five to 12 times faster in super computers. Lastly, we can spot a 256-bit bus interface, which is atypical of Nvidia’s high-end, gaming-focused graphics cards. We’re edging ever closer to the Nvidia GeForce GTX 1180’s theoretical August release date, so hopefully these Nvidia Turing rumors prove to be true. Will AMD Vega graphics cards be able to keep up?